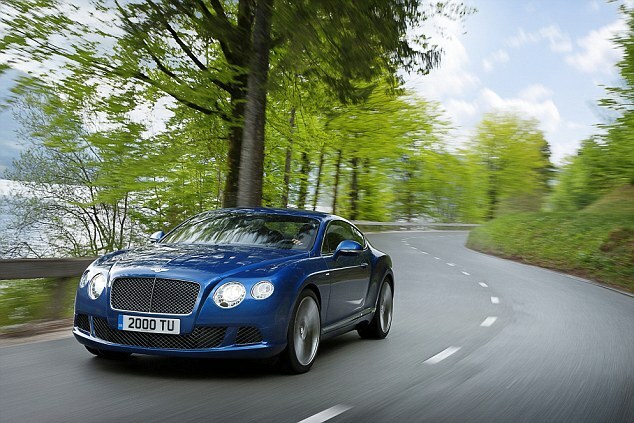 The rumors were true: Bentley will be debuting the car you see here, the 2013 Continental GT Speed, at this year's Goodwood Festival of Speed. And while it doesn't look all that different (if at all) from a standard Conti GT, the changes under the hood are what sets this big coupe apart from its kin. Take notice: With a top speed of 205 miles per hour, this is the fastest production car that Bentley has ever produced. 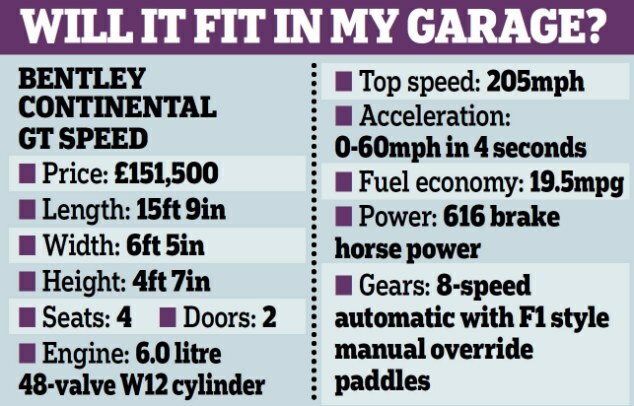 Having enjoyed a sales boom since the start of the year, Bentley today launches its fastest ever road-going car. But if you want to own one you’ll need deep pockets – it’s priced at £151,500. The two-door ‘grand tourer’, which can accelerate from 0 to 60mph in four seconds, is designed to get four people and their luggage down to the South of France in comfort and speed. To achieve such performance it has a vast six-litre turbo-charged engine that produces the same power as six Ford Fiestas. Fuel consumption, unsurprisingly, comes in at a gas- guzzling performance of just under 20 miles to the gallon. Luxury touches include a hand-crafted interior cabin with diamond quilted leather and brushed aluminium facia. Orders for the 2013 GT Speed are being taken as you read this, with the first cars being delivered in October this year. Scroll down for the official press release, and stay tuned for the car's official unveiling at Goodwood, where drivers Juha Kankunnen, Guy Smith and Derek Bell will drive a pre-production version up the infamous hill twice a day. (Crewe, England. 20 June 2012). 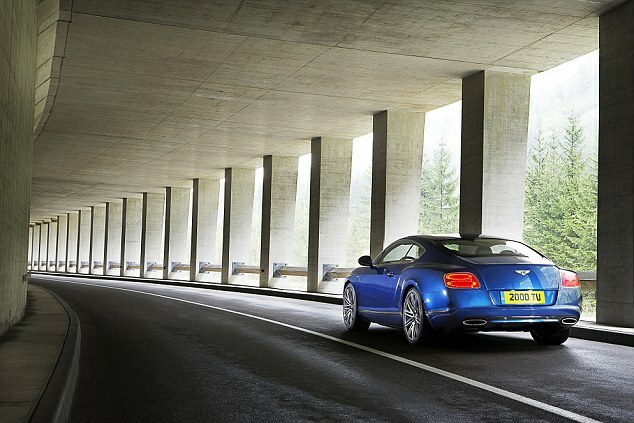 Bentley is introducing a new performance flagship, its fastest production model ever, the Continental GT Speed coupe. The new 205 mph (329km/h) GT Speed will appeal to driving enthusiasts who place a high value on outright performance, agile handling, distinctive design and sporting luxury. Orders for the new GT Speed are being taken now, with deliveries to commence in October 2012. At the heart of the new Continental GT Speed is an uprated version of the unique Bentley 6-litre, 48-valve, four-cam, twin turbocharged W12 engine. For the new model, the legendary Bentley W12 develops 625 PS (616 bhp/460 kW) at 6000 rev/min and 590 lb-ft (800 Nm) of torque to deliver thunderous, supercar performance with effortless overtaking capability. The 0-60 mph sprint is dispatched in a mere 4.0 seconds (0-100 km/h in 4.2s) and on to a top speed of 205 mph (329 km/h). The new Speed's immense power is transmitted via a close-ratio, ZF eight-speed automatic transmission. This state-of-the-art transmission delivers quick yet imperceptible gear changes through intelligent adaptive control software to ensure the perfect combination of speed and refinement. The new gearbox also makes a significant contribution to an overall twelve per cent improvement in fuel economy and CO2 emissions. "For nearly a decade, the Bentley Continental GT has defined high luxury, high performance grand touring and the unique W-12 engine has been so successful that Bentley is now the world's largest producer of 12-cylinder engines. The new GT Speed, with its harder-edged, sportier character, reaffirms this pinnacle positioning and continues to broaden the worldwide appeal of the Continental coupe." The muscular, elegantly sculpted coachwork of the Continental coupe is subtly enhanced with design touches which reinforce the sporting character of the new model. Most notable are the dark-tinted matrix front grille and lower air intakes and the 'rifled' finish to the exhaust tailpipes. Ahead of deliveries this autumn, the GT Speed makes its international debut at the prestigious Goodwood Festival of Speed from 29th June until 1st July. Modern-day Bentley Boys Juha Kankunnen, Guy Smith and Derek Bell will pilot a pre-production GT Speed up the Goodwood Hill twice a day.